I cannot remember how old this tee is but I do know it is at least four years old. I studied in New Zealand and was incredibly obsessed with all of the Australian and New Zealand brands and I went shopping non-stop. This precious tiger tee was from ValleyGirl, an Australian brand. Sure, I could check the tag on the inside of the tee, and I have. It says 'Tightrope', which, if Googled, seems to be attached to Australia. I've bought a few things from ValleyGirl that doesn't have "ValleyGirl" written on the tags, so, I am 90% sure this is a ValleyGirl tee. I tend to match printed t-shirts with basic plain jeans, like any other normal person, but I felt a little adventurous that day. And, OK, OK, all my good jeans were in the dirty laundry basket. So it was my printed jeans from Zara to the rescue. I got this delightful jeans from Madrid, Spain. But apparently not everyone would find these jeans delightful. I wore this in Paris when my brother-in-law Zaf came to visit. Shah told me that when the three of us were out, and I was walking in front of them, Zaf turned to Shah and said, "Liyana's pants look as if they're dirty". Zero offence was taken because he had a complete point; the print on the jeans were so subtle, they really looked as if I haven't washed them in a century. But I love my jeans regardless! By the way, I was pretty slim and fit when I studied in Christchurch, New Zealand, what with all the walking around to everywhere. This tee fits me too snugly around the hips now, so the only way to wear this is to tuck them into my jeans. And walk around with me sucking in my gut, ho ho ho. 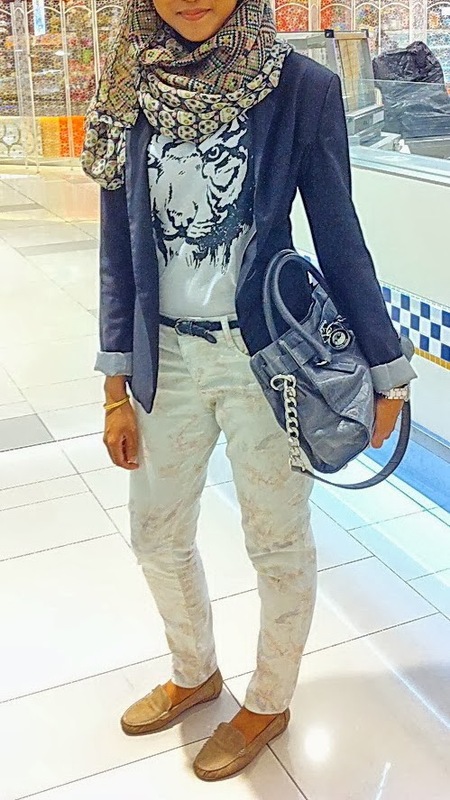 A black Bershka blazer and my grey Michael Kors Hamilton rounded up my outfit. The Hamilton isn't meant to be carried around like a clutch, but I just felt like doing so that night. 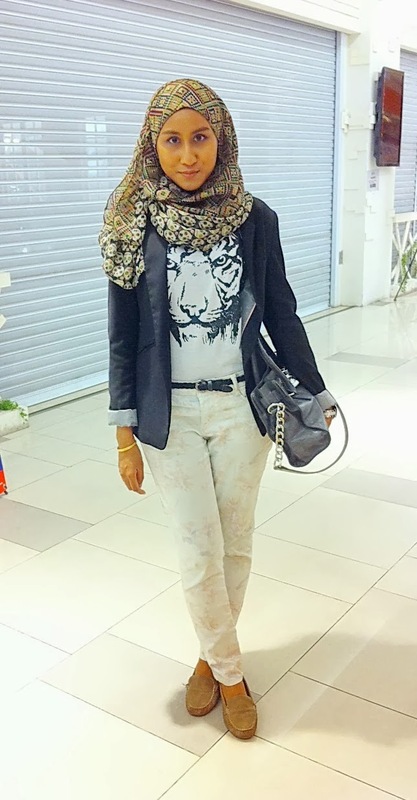 Printed scarf, printed tee, printed jeans. Print on print on print. What do you think?